I found this subject really difficult and took a long time to find a subject. The idea I came up with was based on my early teens when we used to catch the autumn leaves as they fell from the trees, we needed to have 13, one for each month of the year and one for luck, putting these under one’s pillow was meant to bring good luck during the following year. Needless to say drifting leaves are not always easy to catch and who knows whether it works, we were often chided for hanging around and not going to where we were meant to be! We were at a truly carefree age. I find these colours happy, blue skies and green leaves spring to mind and those conditions always make me feel good. 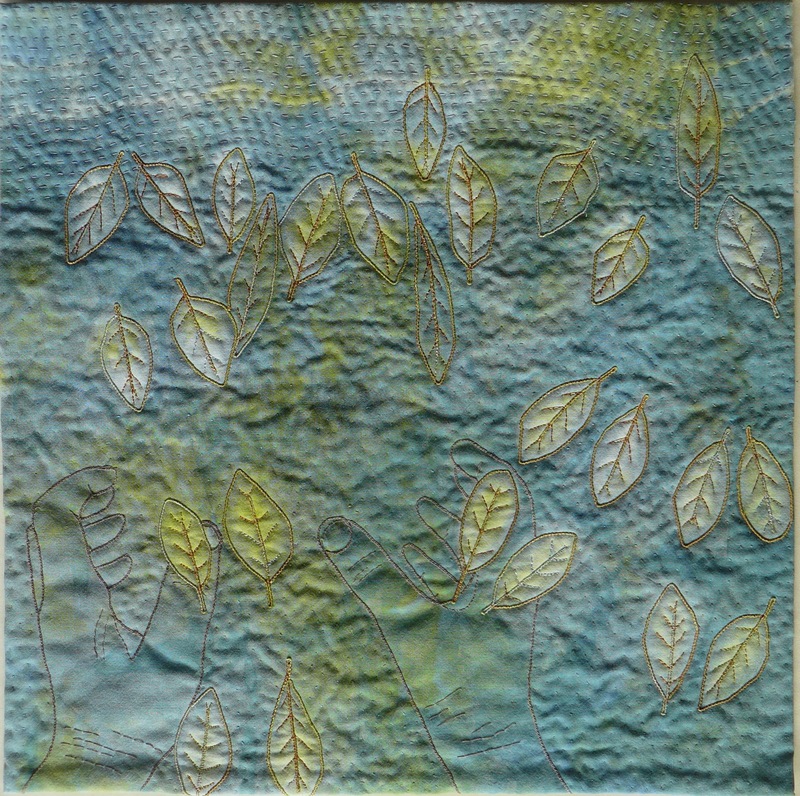 In the end I have used fabric which was snow dyed yellow and then dyed in India in an indigo vat. Before the indigo vat I pleated the fabric rather haphazardly and stitched some wooden leaves in place to create a resist and then I tied the other half of the fabric with string. 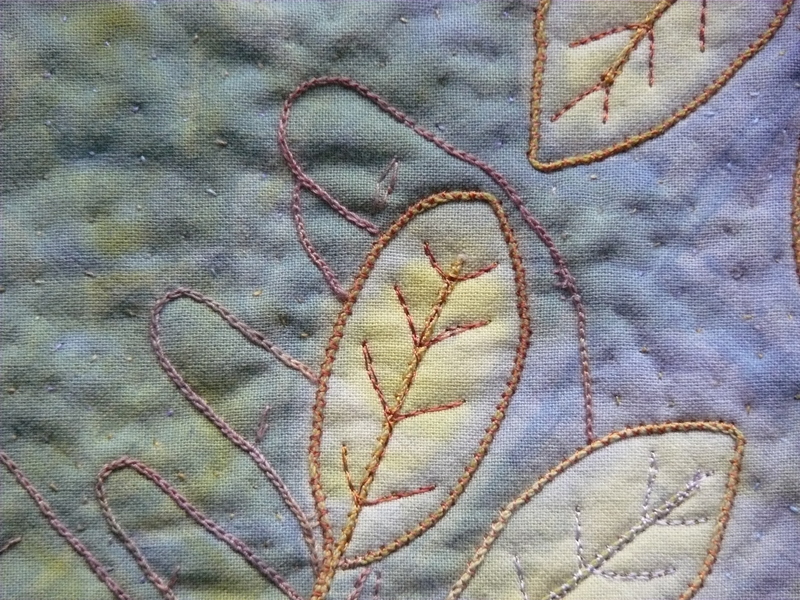 I have used the fabric with the wavy line at the top and the leaf prints/motifs were stitched with firstly with a fine machine zig-zag in autumnal colours over a home dyed greenish/yellow fine cotton cord, the veins were then machine stitched. The rest was hand-stitched I wanted to create an area which was ‘sky’ and an area which was just ‘air’ so the quilting was different. The hands were stitched with chain stitch. The leaves could be seen as a bit ordered but I wanted to follow the shapes on the fabric. Caro, The leaves on blue remind me of leaves caught in a stream, drifting along, not a care in the world…in other words, completely happy! Thanks for sharing your memories in this piece. Spectacular use of handwork. I love the subtlety of the fabric and the delicate nature of the piece. What a beautiful quilt. So interesting how you dyed the background. Very nice embrodery, such tiny stitches.